Deliciously juicy and sweet, tangerines lend a pleasing citrus twist to our gentle Chinese white tea, which is only harvested in early Spring when the Camellia Sinensis plant produces very small buds. Brew this lovely blend to accompany your breakfast or afternoon treat; it’s a flavor to complement whatever you eat! Let’s face it; there are a lot of tropical flavored teas out there. Some are good, some not so good. But, even with the really tasty tropical blends, they can get rather boring after you’ve tasted a few. So it’s nice when you find one that has something a little extra to make it get noticed amongst the typhoon of tropical teas out there. This is one such tea. While it is flavored with some of the ordinary tropical fruits – I can definitely taste pineapple, and maybe orange and even a hint of banana. But, what makes this tea stand out is the tangerine – which is clearly defined in this tea. Yes, tangerine can be considered a tropical fruit since it is a citrus; however, what I like about this tea is not that it includes tangerine but that the tangerine really pops in this blend. It is sweet and juicy and delicious! A tea blend is only as good as the tea in it – and this blend has big “white” tea leaves in it that are covered in fuzzy white down. 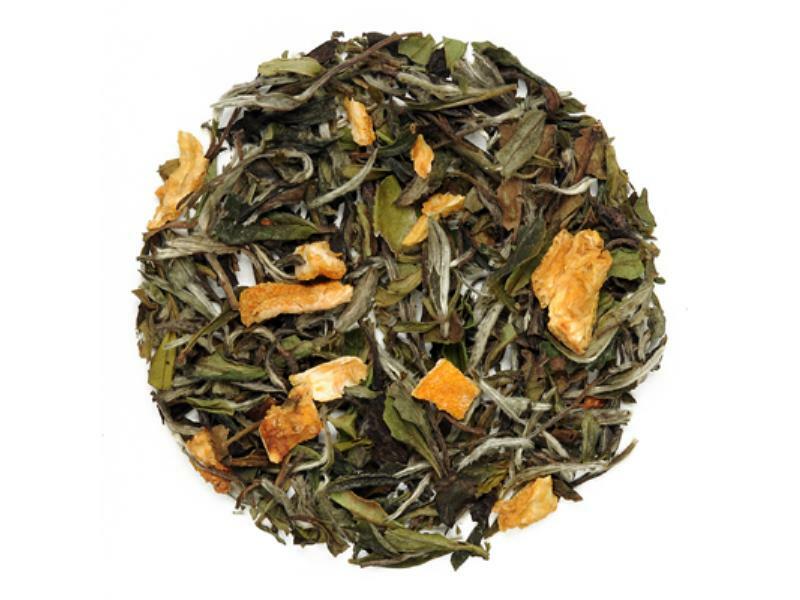 The sweet, fresh flavor of the white tea is prominent in this blend. And while many white teas are very delicate in taste – this tea is not so delicate that it will lose its flavor when iced. In fact – and maybe this is just the warm weather talking here – but, I think this tea is even tastier when served chilled than when it’s served hot, because as it cools the tangerine flavor comes to life even more.